What is Drought Tolerant Gardening? Drought-tolerant landscaping has become more popular and even mandatory in regions that experience little or sporadic rainfall. Some regions and cities impose fines or offer rebates and incentives to homeowners who replace their thirsty lawns and gardens with water-wise plants and hardscape. If you drive by a home with a dying lawn, the residents probably have stopped watering it and are planning to add gravel, river stones, permeable paving, and low- or no-maintenance ground covers, shrubs, trees, and perennials that don't need daily irrigation. What does drought tolerant mean in relation to landscaping and the environment? Let's break it down. The word drought means: "...a period of dryness especially when prolonged; specifically: one that causes extensive damage to crops or prevents their successful growth. "* The word tolerant means, in the broader sense: "capacity to endure pain or hardship," and, more specifically, "relative capacity of an organism to grow or thrive when subjected to an unfavorable environmental factor." That understood, we know that, through lack of rainfall and water, drought causes plants, crops, and wildlife to become parched and eventually die. If a plant is drought tolerant, it is able to grow or thrive during or in spite of a drought. 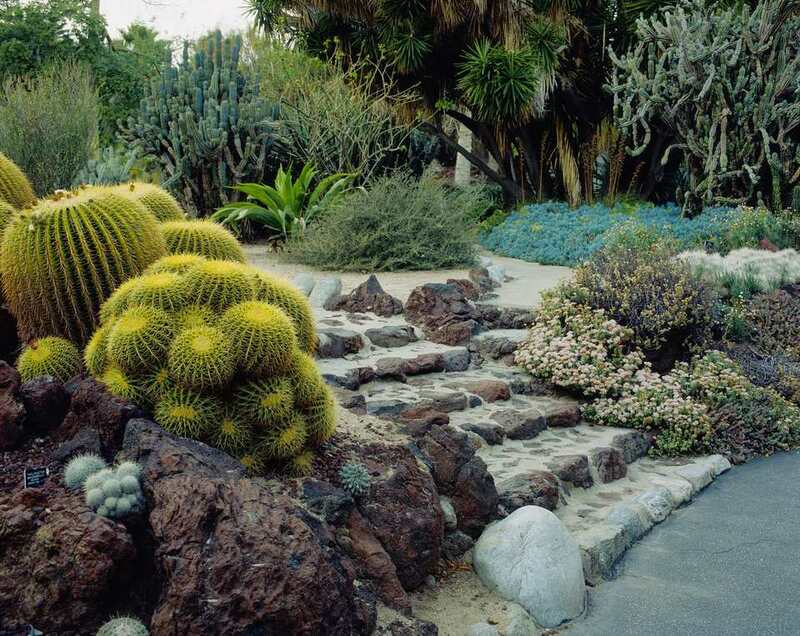 Most drought tolerant plants are what are considered native plants in a particular region. They are the plants, shrubs, and trees that graced the landscape long before settlers showed up with other plants and a garden hose. Check with local universities, master gardeners, and native plant organizations to find out more about the natives in your area. The terms drought tolerant and drought resistant are often used interchangeably—and incorrectly so. While drought tolerant landscaping and plants are able to grow or thrive with minimal water or rainfall, drought resistant plants can survive for long periods of time without water. In others words, they take drought tolerance one step further. For example, Jatropha, a heavily veined succulent with large green leaves and dainty flowers. It stores water at the base of its trunk, and once established, can survive for long periods without water. Plants that have relatively low water requirements or plants that are well adapted to an arid climate are often described as drought resistant or drought tolerant. Xeriscape and xeriscaping are terms used to outline a landscaping style that uses drought-tolerant plants to help conserve water. Water-wise refers to landscaping with plants that grow well in a garden that manages water sensibly. Additional terms for drought tolerant include water-smart, water-conservation, dry garden, dry landscaping, and desert landscaping. Why Have a Drought-Tolerant Garden? In areas of drought—like Texas, for instance—the question would be, why not have a water-wise garden? Record-breaking droughts in Georgia, Texas, California, Australia and other regions have resulted in mandatory water rationing and incentives for water-wise landscaping that uses minimal water. This can be done by cutting down on or eliminating thirsty turf grass, introducing drought-tolerant plants that are natives to the area, and incorporating outdoor living spaces like patios, gravel pathways, and decks. What do you use your lawn for? Why is it there? If the best answers you can come up with are, "in case somebody wants to play on the grass" or "it's there because everyone in my neighborhood has a green grass lawn," then question it. Is that an educated, conservation-minded, do-right-for-the-planet kind of mindset? If you absolutely have to roll on something green once or twice a year, consider turf alternatives, like synthetic turf, drought-tolerant ground covers, or rubber mulch. Who knows—you might discover in the process that there are lots of things with which you'd like to replace that water-guzzling patch of grass. Better yet: satisfy your lawn fix and visit a local park.